Staff at Creative Composites, Lisburn, recently had the opportunity to see the fruits of their labours in the flesh, or, more correctly, in its predominantly composite form. Creative Composites manufactures a range of composite components for Lotus Cars, the Norfolk-based sports car manufacturer, including the entire exterior of the Exige Sport 350, and it was therefore a pleasure for all staff, and particularly the manufacturing team, that Ballyrobert Cars provided a new Lotus Exige Sport 350 from their Mallusk showroom to showcase at their Lisburn facility. 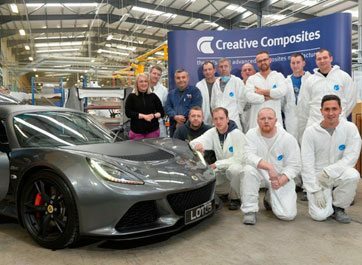 Creative Composites is the main supplier of composite components to Lotus Cars, one of the UK’s leading sports car manufacturers, manufacturing a range of components from durable and lightweight composite materials. 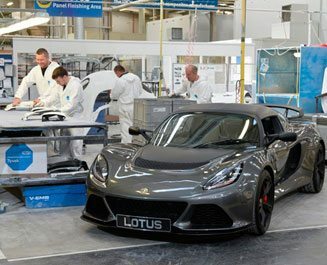 Lotus builds some of the world’s best respected, and highest performing sports cars, including the benchmark Evora 400, the iconic Elise, and the revered Exige. 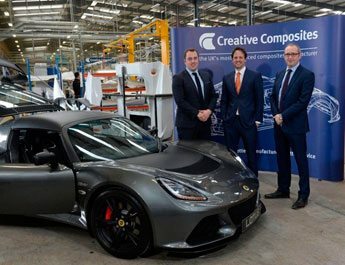 The fact that Lisburn-based Creative Composites makes such a significant contribution to the manufacture of these globally-renowned models underlines the success and expertise of a highly-skilled and ambitious local company. With design, R&D, manufacture and sales all based in Lisburn, Co. Antrim, Creative Composites serves global OEMs and blue-chip companies with composite materials which have advantageous properties over traditional metals and plastics. The company is served by a purpose-built manufacturing facility and has expertise across a range of manufacturing technologies serving a diverse range of industries including automotive, rail, bus & coach, off-highway and medical. For more information on Creative Composites, please visit www.creativecomposites.co.uk, or email Marketing Manager, Colin Hassard, at colin.hassard@creativecomposites.co.uk.